Anyone know where I can find these hinges??? That's honestly the oddest hinge I've ever seen. 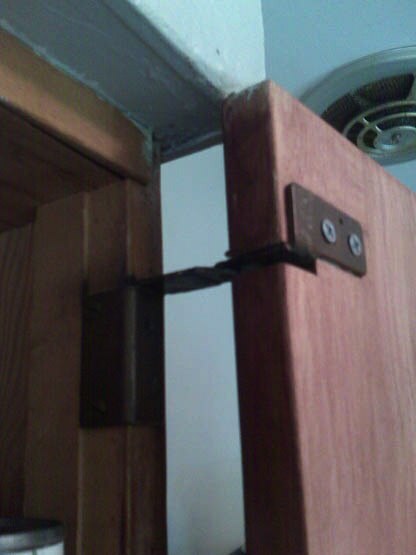 I'm almost convinced it's an ad hoc adaptation, in other words a truly "custom" hinge...cool, but not standard. That said, surely Hafele has something. Or Outwater Plastics - they tend to have knowledgeable salespeople; you could probably send an email with those images and if the hinge exists they'll find it for you. 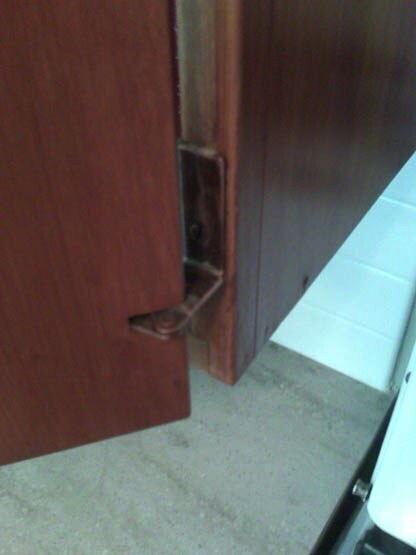 It's been confirmed as a real hinge used mid-century. I only need two and they're super hard to find. I'll check out those recs ib - thanks! this is an amerock hinge that seems 'close' to yours? Fay Jones used those hinges in some of his Fayetteville houses. Maybe you should sign up for a house tour, and see if the owner has any laying around in a drawer. Yeah, architectural salvage might be a good place to start too. Around here they tend to mostly have mainly 1920s era stuff, but they are starting to have some MidCenMod just lately. You might also try Rejuvenation - they do some antique hardware selling, and again offer amazing customer service. Yes -- pivot hinge (one manufacturer calls it a knife hinge, though that's not quite right). Try Stanley, or Amerock. The slotted installation was quite typical; another style, with a wedge-shaped screw plate, are installed at top and bottom of the door. The one shown above by el jeffe is the top/bottom mount style. The tapered portion can be mortised flush into the door, for a minimal top/bottom door gap (reveal). damn, i couldn't post at work. but yeah, it's pivot. in looking around, it might be something you'd have to get custom made for exact replica, i haven't before seen the full wrap. Not a perfect match. 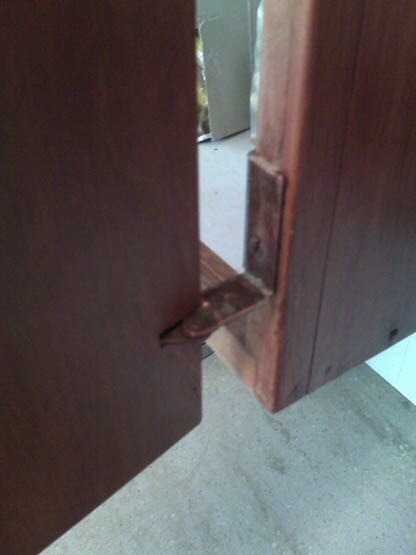 Are you trying to replace one of these hinges, or are you starting from scratch ? Does the finish matter ? you might also try asking cabinet makers. not the production shops but the custom fab shops that have been around a long time. if you still have access to the site, go back and examine a hinge closely. it might have a manufacturers stamp or some makers tooling on it. you might even try to take a door and hinge apart. Looking for a mark is a good idea. In my experience, logos, etc are always stamped on the face, not the back, of hardware like this. . .
Man, I have looked in all my go-to catalogues for a similar jamb-mounted offset pivot cabinet hinge, and CANNOT find it! This is a good hunt, Paul! I even tried the marine hardware catalogues... you never know. They are great sources for weird hardware. No such luck though. MacMurray Pacific in San Francisco -- do you have a branch in LA ? 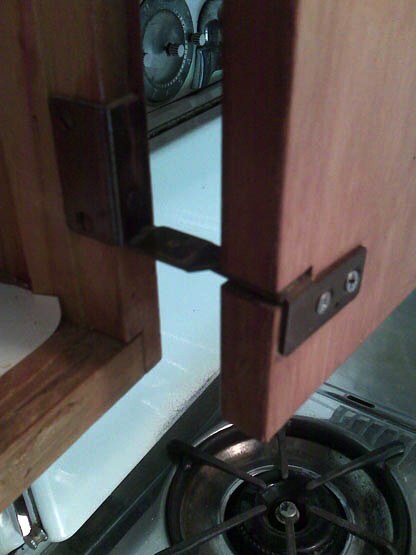 My parents, both architects, used this hinge in the house they designed in the mid 1960's. I'm replicating the same cabinets in my house. We have those exact hinges, and I'm working on cleaning ours up - because the only ones I've found are merely a close match. All of my baby pictures match our kitchen, so circa 1965-ish. The ones that were closest were NICO brand on the Hardware Tree website. Did you ever find a match???? Do you also bychance have approximately 1 1/2 x 2" rectangular cabinet pulls, copper or brass on a 1" center? Most of the pulls only have one screw in the middle - these have two. If you find a supplier for these, please pass along the info. For now, we're trying our best to clean up and/or repaint what we've got. It's a challenge! I know this is an old thread but if anyone is looking for Amerock 1247 pivot hinges, just email Amerock and if possible include a photo of the hinge. Their email is amerock.consumersupport@amerock.com. I alway go to Carter Hardware on Robertson Blvd. when I'm trying to source things like this. If you call and then email them your photo I think the chances are good that Tony Carter or someone there will know.